Frédéric Molas, aka Joueur du Grenier (Attic Gamer). Joueur du Grenier ("Attic Gamer"), real name Frédéric Molas, is a very popular reviewer on French-speaking YouTube, creator of a video series of the same name where he reviews old video games with comedy. Some specials have him reviewing nostalgic cartoons or TV shows instead. His videos get millions of views. Being inspired by Cinemassacre's Angry Video Game Nerd (James Rolfe), Molas started the Joueur du Grenier series in 2009 and keeps making them to this day. His gimmick is quite similar to the AVGN (i.e. 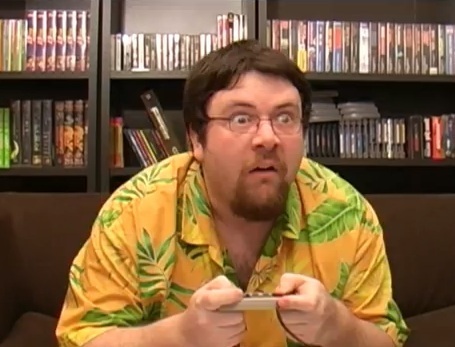 angrily reviewing a game, destroying cartridge...), but most of his viewers are unfamiliar with Rolfe's work and over the years, he added his own flavor to it by using a lot of typically French humor and cultural references. Very few of his videos have been subtitled for foreign viewers, as much of his comedy is untranslatable (especially the frequent use of puns). He is popular enough to have been several times on other famous YouTube shows and getting his own comic book series. He made a cameo appearance in Cinemassacre's Mike Matei's NES Hacks video and Doug Walker (from ThatGuyWithTheGlasses) made cameos in two of Joueur du Grenier's videos (the Platoon/Metal Gear review and the Elite Forces/GIGN review). Screenshot from the opening credits: Goonies II is the only unreviewed game shown. Joueur du Grenier's opening theme credits have many excerpts of his first game review episodes. 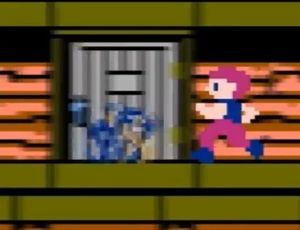 However, for a split second, An excerpt showing the Goonies II NES game is shown. This has baffled some fans since there never was a Goonies II review video by Joueur du Grenier. In a (now-deleted) forum topic, Molas himself explained that he began shooting a review of Goonies II, but as work progressed, he realized he didn't have enough material for a full episode and so cancelled it. Despite this, he still used footage of this game for his opening credits. Apart from this, he didn't release any of the shot footage and it is unknown if he will ever release it, as a DVD extra or a portion of a multi-games review episode. On April 6th, 2016, in his X-Perts review, Joueur du Grenier actually addresses the short footage of Goonies II that has appeared in his opening sequence for years despite never making a review of the game. He makes a very quick review, saying it isn't too bad. When asked why he even inserted the game's footage inside his opening, he replies that was because he rushed it. However, the review here looks recent and made for the episode, and the original material probably seems to still be lost. Joueur du Grenier addresses the Goonies II allusion at the beginning of this review.